In this article, we equipped some of the useful information related to jkpsc.nic.in. JKPSC which is known to be Jammu and Kashmir Public Service Commission. If you are one amongst them in search for latest JKPSC Phone Number, Office Address, Recruitment, Syllabus, Admit Card, Result, Previous Papers? If yes, you were at the right place to check all the information at one place. In current days many candidates are seeking for an opportunity in JKPSC and are striving hard to get placed in Jammu and Kashmir Public Service Commission. Finding a job opportunity in jkpsc.nic.in is a bit difficult task as most of the job seeking candidates are after Jammu and Kashmir Public Service Commission. For the sake of these categories of aspirants, we designed this article with most useful information. We strive our level best to make the information more accurately for the aspirants in search for JKPSC Jobs. Most of the job hunters shown their interest in Jammu and Kashmir Government Jobs for the reason of job security. By referring the complete article you can find more important stuff related to latest Job Openings in JKPSC. The below table gives the brief details about jkpsc.nic.in JKPSC Address, Phone Number Details. Phone Number (Summer office May to Oct.) Tel: Srinagar 0194 -2310369 Fax:Srinagar 0194 -2455089. Office Address (Summer office May to Oct.) The Jammu & Kashmir Public Service Commission Solina, Srinagar, Kashmir. (Winter office Nov. to April) The Jammu & Kashmir Public Service Commission Resham Ghar Colony, Bakshi Nagar, Jammu. Jammu and Kashmir Public Service Commission is a government body for selecting the most capable and deserving persons, for manning the civil services and posts and perform other functions assigned to the Commission in accordance with the mandate of the Constitution. The main functionality of JKPSC is to fulfill the requirement of staffs JKPSC recruits personnel from all over the country. JKPSC will provide an opportunity for both Fresher and experienced and the qualified candidates will be placed all across the state in reputed positions. Are you in search for a career opportunity in jkpsc.nic.in. The following notification table gives a clear picture over JKPSC Recruitment Notifications. 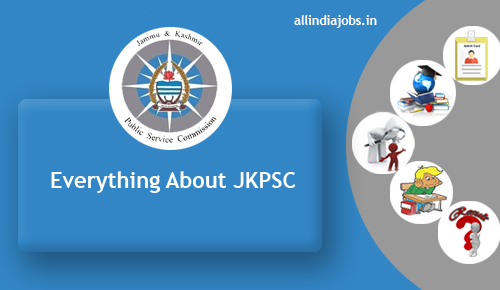 For the easiness, of job seeking aspirants we arranged some of the valuable news about the latest and upcoming JKPSC Job Openings. All the latest official advertisements released by Jammu and Kashmir Public Service Commission will be updated from time to time. Aspirants for further latest Jammu and Kashmir PSC Jobs can visit the official website of JKPSC @ jkpsc.nic.in. In the below section you can get a clear picture of all the latest recruitments which are tabulated in the below. Check all the specifications and apply for the job prior to the closing date. Also, Check latest Jammu and Kashmir Government Jobs. Latest JKPSC Syllabus is tabulated in the below section. In order to give a helping hand for the candidates who want to clear the first round of selection can check the Syllabus along with Exam Pattern. The syllabus is the key aspect in any exam preparation. For those who decided their career in JKPSC the Syllabus is helpful for them in order to get placed. At the time of preparation, the Syllabus will help the candidates to make a proper schedule and to cover all the topics which in turn boost up their confidence level. For more detailed information about Syllabus and Exam Pattern that is officially released by Jammu and Kashmir Public Service Commission. Once after done with the check with the syllabus candidates must have to be aware of Previous Papers in order to get an idea over the JKPSC Test Pattern. Many of the applicants find difficulty in searching with JKPSC Previous Year Question Papers. Along with Syllabus Model Papers will also help the contenders those who had applied for recruitment and about to write the written examination on various examination centers at scheduled dates. To help you in preparation time we had tried our level best and share some useful info for the sake of candidates. All the latest information related to JKPSC Admit Cards will be updated in the below table. For those contenders who are in search for latest JKPSC Hall Tickets can get all the necessary help from the session below. Our experts made some research and collected the information from various websites and made them available at one place. For utilizing all this data you have to keep an eye over us to know about the latest update. Admit Card is equipped with details such as candidates name, roll number/ registration number, date of the written test, venue of the exam, some important instructions related to the applicant. Check the details printed in the Hall Ticket is correct or not soon after completion of downloading the Call Letter. Candidates appeared for the exam are eagerly waiting for JKPSC Result. Aspirants can check their final Results by visiting the official website of Jammu and Kashmir Public Service Commission @ jkpsc.nic.in. In order to check their result contenders must have to be ready with a valid Hall Ticket/ Registration number. We insist candidates keep score card copy safely for further process like counseling/ admission process. Soon after done with the Written Test, all the applicants are very curious about their performance and to be aware of the information whether they were eligible for the further rounds of selection or not. Make a consistent visit to us in order to check the latest Jammu and Kashmir PSC Results. Hope all the information is helpful for the job hunters of JKPSC. For latest updates keep visiting our website www.allindiajobs.in regularly. Stay connect with us to get up to date information about jkpsc.nic.in.